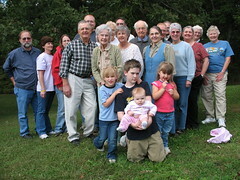 This weekend included a whirlwind trip to a family reunion. I left home hours before dawn on Saturday, drove 540 miles south on I-35, and met up with my father, sister, and niece in a small town in Missouri. After long conversation at a local restaurant (it was an hour before our food arrived) and a good night’s sleep, we gathered with a few others of the clan for a lunch, some more good conversation, and the mandatory group photo. Then back on the road to be home in time for work on Monday. What makes it so worthwhile? As the family gets smaller, and also more spread out, it’s a rare occasion to find the rest of the family that needs more space for books than for clothes, travels to dance, values and remembers the same thing. We are in need of a term for this: family values has taken on political overtones. How else to say “putting a premium on a small slice of time with people who – at least genetically – share more than any other group on earth?